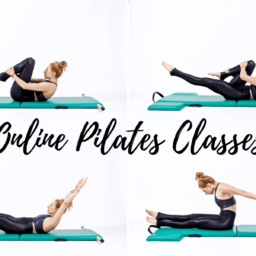 Preparing you for Pilates exercises like Teaser, Boomerang, and Jackknife! Learn to connect to your seat as you move your legs up and down. The Double Straight Leg Stretch aka Lower Lift was not part of the original mat order left by Joseph Pilates but one of his students Romana Kryzanowska added a few more exercises to the ab series. Many of his other students also took on this addition and together they make of the Ab Series of 5. This exercise really does challenge your center to control your legs distally and prepare you for other more advanced exercises like Teaser, Jackknife, Boomerang and more on other pieces of Pilates apparatus. This exercise has a wide range to work with. If you are just starting out you may only lower and lift a little. But, as you become more advanced you will find that you can lower all the way to the floor and lift back up without losing your center! Wrap your outer hips around as your legs lower and lift! Place your hands behind your head and press your heads into your hands and your hands into your head. This pressure will connect your upper back muscles and help you keep your neck from overworking! Take your straight legs up to the ceiling and lower your legs towards the floor and lift your legs back up. No swinging! As you get really good at reaching the legs out and down and out and up you can play with the range your legs move. There are few rhythms I like to play with. The first is to inhale as you lower and exhale as you lift. And then reverse the breathing and exhale as you lower and inhale as you lift. After you have mastered those lower your legs halfway down and then all the way up, then two-thirds of the way down and then all the way up. Then, two-thirds down and halfway up and then two-thirds of the way down and all the way up! Have fun with it! It's not easy but you'll feel your seat and center really connect and help you and then channel this feeling when you have to take your legs overhead and up in Jackknife!